A new study out of the Stanford University School of Medicine shows little to no difference in terms of health and nutrition when comparing conventional and organic foods. While organic foods may be more expensive, it has nothing to do with them being better for you but instead has more to do with the farming practices and market demand. In fact that demand has grown rapidly in the last 15 years as sales of organic food have increased from $3.6B to $24.4B according to the Stanford research. A sure sign that food is becoming a hot topic among individuals and families who are seeking to become more informed about what they eat. The problem is that there is a lot of misinformation out there demonizing conventional food and praising organics while using scare tactics instead of science. Speaking of hot topics, food sustainability is a major concern as our global population continues to grow by 200,000 each day. How and what are we going to feed everyone? In terms of sustainability, modern techniques of growing fruits and vegetables and raising livestock are simply producing more when compared to organic practices. Through modern improvements in seed technology, plants now require fewer pesticides and water. Improved genetics in livestock allow those animals to grow faster, with less feed and on less land. Conventional farmers are not only yielding more, but they’re practices are benefitting the environment. To back that up, the University of Oxford released information this week stating that organic farms are indeed not better for the environment. This discussion is a difficult one because food, nutrition and health can be very emotional issues. The positive side of this issue is that Americans are extremely fortunate in that they have so many choices when it comes to what they eat. Whether it be organic or conventional, the freedom to choose is yours. 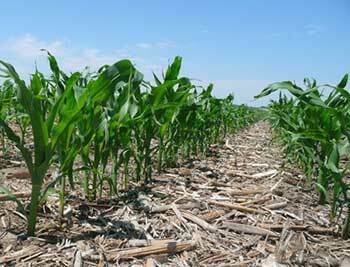 This entry was posted in News and tagged conventional, corn, environment, organic, sustainability.